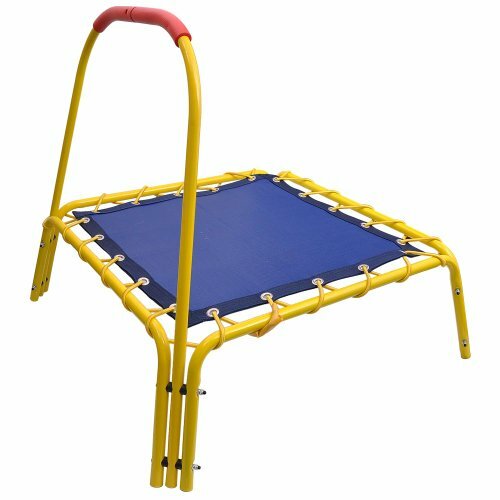 Mini trampolines for toddlers are the best way to get the little ones up and bouncing in a safe and fun way. Rest assured that these toys have been designed with the safety of kids in mind. They are small enough that when the weather is nice they can be a great kids backyard toy that will combine fresh air and exercise. The mini trampolines designed for toddlers will have a handlebar that is easy to grip and will keep the kids balanced and safe until they become comfortable enough to bounce around without it. The price is right and a great selection of mini trampolines are available between $50.00 and $100.00. This is part trampoline and part interactive animal sound game. The 36 inch bouncer comes with a jump mat that emits fun dog and cat sounds as your toddler jumps on that image. It will develop balance and motor skills as your child jumps from animal to animal. 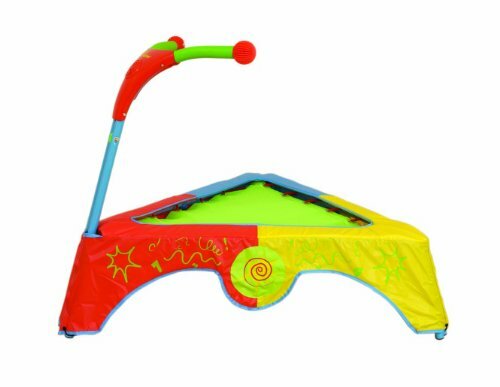 The padded frame cover attaches to the slip free jump mat and the padded safety handle all combine to make this toy safety feature rich. The toddler will have no trouble getting on because the jump surface is only 8 inches high. The sound feature operates with 4 AA batteries and there is a convenient on/off switch included for parental controls. This one is for 3 years and up and a maximum weight of 77 pounds. This will provide hours of entertainment and exercise and is great for indoor and outdoor use. It is designed with a scratching free bungee system which is much safer than coil springs. It comes with an easy grip handle that is removable and covered with foam rubber. This colorful bounce toy is electronic and teaches while kids bounce. It has a handlebar that is similar to a bike and brightly colored mats. It is for ages 3 and up and features a 5 in 1 multi game sound system that has music, silly sounds, animal sounds, memory match and bounce counting. Bounce to fun learning games and silly songs for hours at a time inside and out. The weight limit for this mini trampoline is eighty pounds. This is a starter jump toy for 12 months to 4 year olds. It is a practical toy for small spaces and stores easily. This one is a ton of fun for your little one to enjoy for hours of adventure and exercise. Great for learning balance and coordination and to keep them active and entertained. 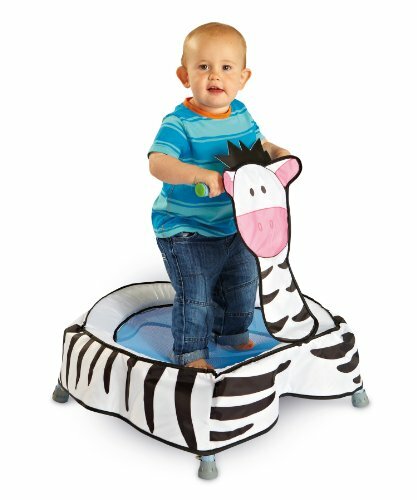 The zebra themed bouncer comes with safety padding and an easy grip handle. It also makes funny sounds as your child bounces. Weight limit is 44 pounds. This trampoline is designed with easy storage in mind. The handle screws off easily and the legs fold down to store easily. Your child will fall in love with this bouncer that can be used indoor and out. Best for kids 3 years and up with a weight limit of 77 pounds. 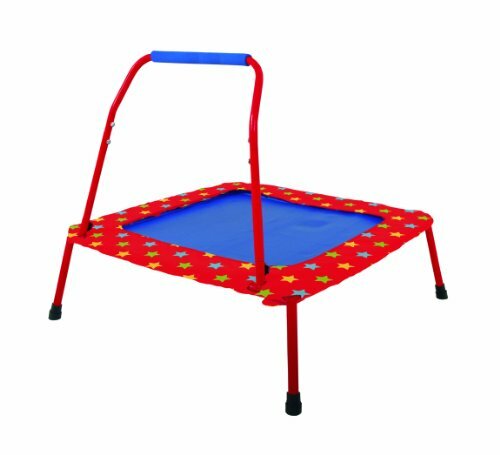 Quality designed with safety in mind, it is a junior trampoline with a tubular steel frame and for extra safety there is a padded cover around the mat that cushions the frame and prevents children from stepping through. 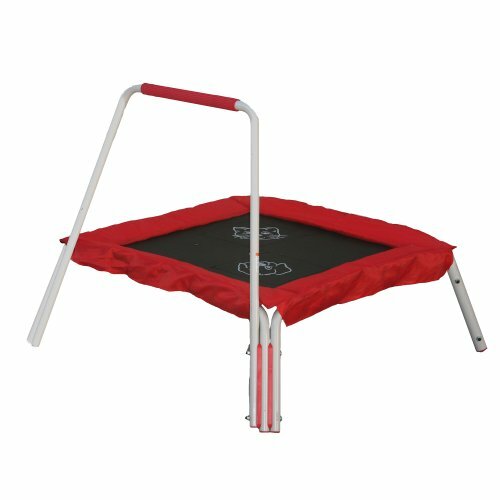 If you would like to see a larger selection of trampolines please visit our Products-Gifts site by clicking the button.